Only white monuments extending up into the hillsides mark the border between Mexico and Guatemala. In daily life, these demarcations seem to matter little. Trucks drive across, children play in the small stream that forms at the border in the rainy season, and laborers and families walk across. There are no fences, officials, or other indicators that one is entering another country. A sign delineating the border was erected only in the summer of 2007 (Figure I.3). Figure I.1. 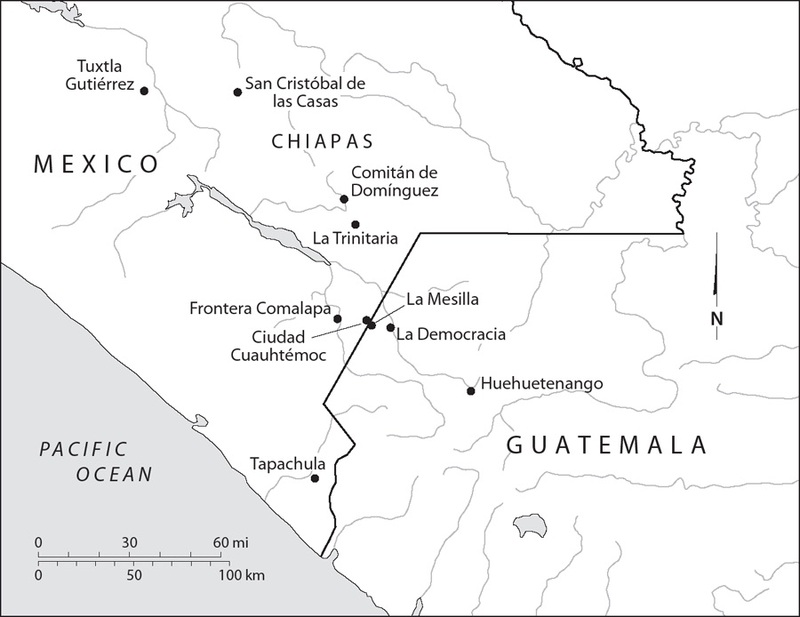 Map of Chiapas, Mexico–Guatemala border region with key cities. SOURCE: Map Data@ 2016 Google, INEGI. Figure I.2. Map of border communities. SOURCE: Map made by author. Figure I.3. 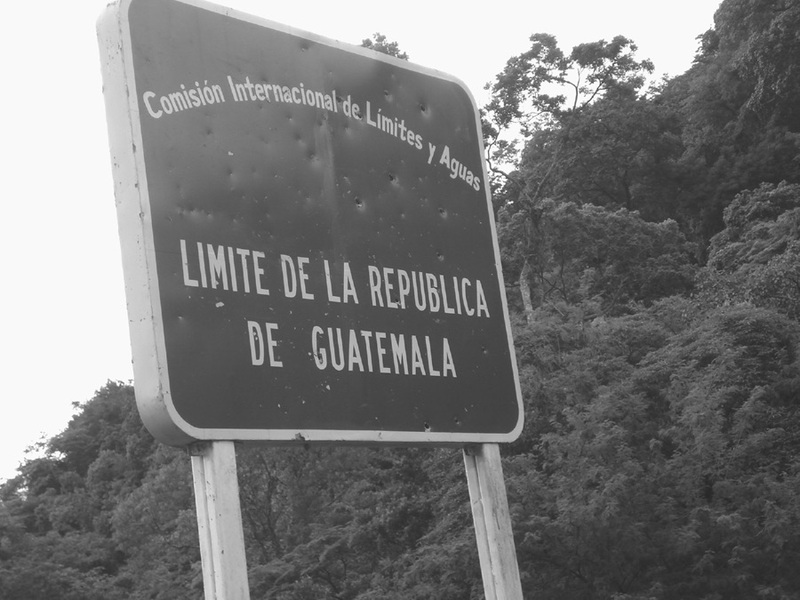 Sign demarcating Mexico and Guatemala, erected in summer of 2007. Although generally devoid of state officials, the Mexican military was periodically stationed within this route in the spring of 2007. I was told that this was in response to then recently elected President Felipe Calderón’s promise to take a hard-line approach to border security and drug violence. At first, smugglers and residents waited for the military Humvees to retreat before crossing the border, but after a few weeks they began conducting business as usual, driving right by the soldiers. Therefore, I was caught by surprise when a Mexican soldier stopped me for questioning in May 2007 when I was driving from my house on the Mexican side to visit friends on the Guatemalan side. As I got out of my car, I grew nervous. After living at the border for eight months, I was unaccustomed to encountering agents of the state, and I was not carrying my passport. “What are you doing in this illegal pathway?” the soldier inquired, implying that because the route lacked official recognition it, along with the people and activities present within it, were illegal. As we were talking, I glanced over my shoulder to see people smuggling gasoline canisters clanging in the back of pickup trucks over the rocky hills to Guatemala. I soon learned that the soldier viewed me more as a curiosity than as a suspect. As I fumbled to explain my research, I realized he was more concerned with what residents thought about the military conducting surveillance in a border route where residents resent official interference. He asked incredulously, “You live here? What do the people think of us?”6 This encounter led me to question my presumptions about security and illegality. Were security and border control a mirage? Were security and illegality more intimately intertwined rather than opposed? How do designations of illegality become mapped onto border regions and populations and to what effect? The ease of commerce transiting this unmonitored road contrasted with the official rhetoric to prioritize border security emanating from Washington, D.C.; Mexico City; and Guatemala City. When I arrived at the border in September 2006, I introduced my research by stating that I was studying the paradoxes of a border that was increasingly open to trade through regional trade agreements but that restricted the movement of people through enhanced security measures. The most common response was incredulous laughter. Residents were perplexed at the assumption that there was more security. Each time I have returned to the border since 2006, there has been an increased presence of border policing and military units and more visible contraband. Security forces were present, but to residents they did not conjure a sense of security in terms of protection or the curtailment of illicit flows. In the context of regional official trade integration and enhanced border policing, why would residents perceive this security presence as laughable? Why would they be smuggling more goods across the border? Generally, with trade liberalization, smuggling of goods to evade tariffs decreases, concentrating on more prohibited items.7 Residents were also increasingly justifying the smuggling of basic goods as legitimate and gaining official tolerance for these activities. Why do official policies lead to contradictory, puzzling, or even counterproductive results? This question can be answered by bringing to the fore the voices of people impacted by policies, who tend to be omitted not only from policy design but also from implementation and evaluation. In contrast to macroeconomic analyses that debate how trade integration and militarized border security affect illicit flows or that posit illicit trade as an inherent threat to state security and stability, everyday interactions among regional inhabitants, officials, and smugglers provide insight into how policies are experienced in particular places and may generate unintended consequences. 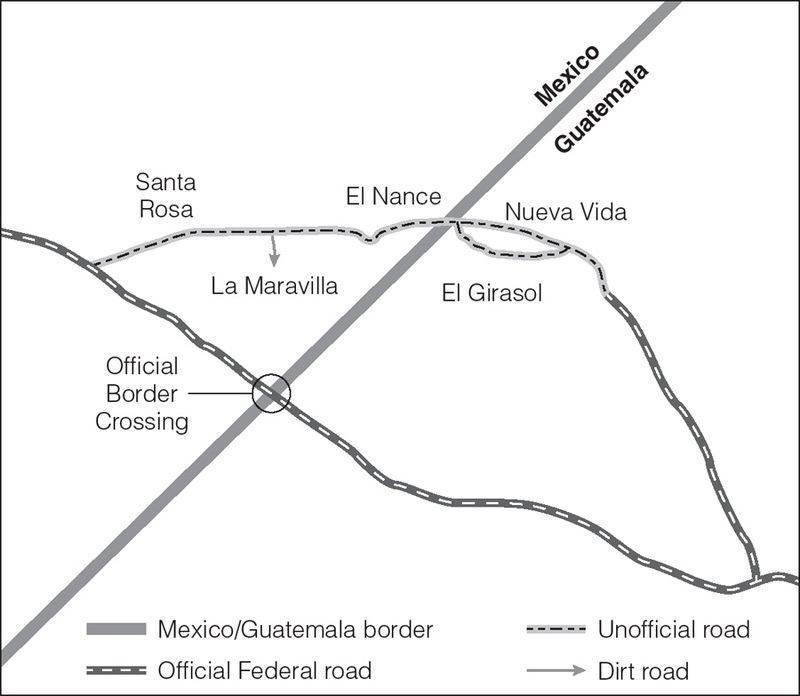 Contraband Corridor challenges simplistic assumptions regarding security, trade, and illegality by detailing how residents along the Mexico–Guatemala border engage in, and justify, extralegal practices in the context of heightened border security, restricted economic opportunities, and trade integration policies that exclude local inhabitants. Rather than assuming that extralegal activities necessarily undermine the state and formal economy, this book extracts this question as a topic for ethnographic investigation. At the border, informality, illegality, the formal economy, and security logics intertwine and blur in the context of what I call securitized neoliberalism, or the wedding of security policies to neoliberal economic policies and logics.8 Securitized neoliberalism works to value certain economic activities and actors and exclude and criminalize others in a context where the informal and illicit economy is increasingly one of the poor’s remaining options and informality also permeates the formal sector.9 The distinction between contraband and business privileges particular economic activities as it criminalizes the livelihood strategies of marginalized inhabitants. Although security, neoliberalism, and illegality are interdependent in complex ways, how they unfold depends on contingent negotiations among diverse border actors. Extralegal economic activities, like smuggling commodities across the border, provide a means for borderland peasants to make a living in the context of neoliberal economic policies that decimated agricultural livelihoods. Yet smuggling also exacerbates prevailing inequalities, obstructs the possibility of more substantive political and economic change, and provides low-risk benefits to select formal businesses, state agents, and illicit actors, often at the expense of border residents. Moreover, the threat of the extralegal economy bolsters a border security agenda10 that conflates different illicit and informal activities and fosters a politics of criminalization that makes locals less secure. As the Mexico–Guatemala border has emerged in recent years as a geopolitical hot spot to contain illicit flows, Contraband Corridor seeks to understand the border from the perspective of its inhabitants. An ethnographic perspective entails not only listening to local viewpoints, but also experiencing border life with residents over time to reveal the larger landscape in which the informal and illicit economy is situated, understood, and debated. People are not only influenced by the inequities of the border but also actively shape and bend it to suit their own goals. Local inhabitants have long depended on the border, before, in the midst of, and when security is repeatedly interrupted.13 Ethnographic research involved interviews with border residents, local officials, and regional producers, as well as participant observation and engaging in daily border life for one year between September 2006 and September 2007 and follow-up visits in the summers of 2008, 2011, and 2014. For residents, transporting goods across the border has long been a legitimate form of making a living and accessing goods in a relatively neglected region. Chiapas is Mexico’s poorest state, and Huehuetenango is one of Guatemala’s poorest departments.14 Border populations have often historically shared stronger ties across the border than with their fellow nationals.15 In contrast, states label these cross-border trading practices as contraband, referring to selling goods across the border that may be prohibited, stolen, evade taxes, or avoid official inspections and procedures. As Jean Clot observes, the label of contraband obscures not only historical border interconnections but also how it is the very formalization of the border and its regulations that create the problems of informal and extralegal commerce.16 Often called comercio hormiga, border populations historically smuggled small amounts of goods, often of little monetary value, through repetitive small trips across the border.17 Yet now this is also occurring using multiple ten-ton trucks and trailers carrying more substantial amounts of goods. Although many people transport goods for personal consumption and subsistence, smuggling has also become a business relied on by border inhabitants, formal businesses, and more illicit actors. Although as old as the border itself, smuggling intensified in the 1990s due to economic crisis on both sides of the border, the collapse of traditional livelihood options, and improvements in infrastructure and technology. Although intended to serve megadevelopment or extractive projects and facilitate regional trade integration, highway expansion in Chiapas in the 1990s also expedited extralegal commerce and communication in the region.19 Residents began to acquire both the trucks and the capital to invest in smuggling businesses as a result of rising migration to the United States in the 1990s. In this same period, the border communities gained access to telephone service soon after receiving electricity. In the early 2000s, people began purchasing cell phones; in 2013 smartphones were making inroads. From the 1950s through the 1990s, Mexican and Guatemalan officials, including immigration agents; customs officials; state, municipal, and road police; and the military, intermittently patrolled this route to varying degrees. In the mid- to late 1990s, border residents organized to expel state agents from this route. Residents asserted their authority to control the border; monopolized positions as smugglers, truckers, and cargo loaders in various contraband trades; and erected community tollbooths to tax smugglers using the road to fund local projects. To inhabitants, these practices are not illegal but represent legitimate advancement strategies amid declining opportunities. Yet residents are also ambivalent about smuggling. It provides job opportunities where few legitimate alternatives exist but also exposes residents to risks. The intersection of neoliberal economic policies with the intensification of security initiatives at the Mexico–Guatemala border did not create contraband, but it provides the context for understanding why residents increasingly relied on smuggling and how and why this historical livelihood strategy has become increasingly criminalized. The advent of neoliberal20 free market economic policies in Mexico and Guatemala in the 1980s, which accelerated in the 1990s and 2000s, exacerbated prevailing inequities and contributed to rural dispossession, an increasing dependence on the informal economy, and rising internal and international migration.21 The effects were particularly acute for Mexico’s poorer southern states like Chiapas and in Guatemala’s western highlands. In 2012, Alan Bersin, then U.S. Assistant Secretary of Homeland Security, stated, “The Guatemalan border with Chiapas is now our southern border” in the fight to curtail the northward flow of undocumented migrants, criminal networks, drugs, and other illicit flows.59 In July 2014, Mexican President Enrique Peña Nieto implemented Programa Frontera Sur, the Southern Border Program, in coordination with the United States to curtail rising numbers of Central American minors crossing the U.S.–Mexico border in the summer of 2014. In the cartography of U.S. hemispheric security, the Mexico–Guatemala border, deemed comparatively less important economically than the U.S.–Mexico border, began to take on “the function of the ‘last border,’ where the geneses of problems occur, which can contaminate the northern border.”60 Symbolically, politically, and economically, the Mexico–Guatemala border is at once depicted as a region of potential opportunity and threat, mostly in line with U.S. economic and security interests.61 Recent media and policy outcries directed to Mexico’s southern border reflect an intensification of the situation but often misconstrue it as something new. The shift of U.S. border enforcement and moral panics about unruly borders to Mexico’s southern border has been underway since the 1990s and early 2000s. Nearly every Mexican security brief, transborder initiative, and even WikiLeaks cables target unmonitored border routes as hotbeds for drug trafficking and criminality with little additional context. Official accounts assume that informal activities, and official tolerance of them, generate a larger climate of insecurity and lawlessness conducive to organized crime without parsing out the differences between different actors, practices, and underlying conditions. Local newspapers and state officials depict border residents as criminals or stubborn peasants ready to blockade the road with machetes. Official sources posit the remedy to be the regularization of informal crossings. According to recent estimates, only 125 immigration agents patrol the entire Mexico–Guatemala border.88 Unregulated commerce also occurs though, and within plain view of, official crossings, such as across the Suchiate River in Ciudad Hidalgo, Mexico, and Tecún Umán, Guatemala. Moral panics over informal and illicit commerce fail to grasp how informal commerce has provided a livelihood for generations and how it is integrated into the wider economy. Furthermore, placing the responsibility for security in the hands of official units often linked to corruption and the very criminal groups they are charged with combating only serves to augment the climate of violence and insecurity. Local inhabitants largely view smuggling commodities as legitimate business, whereas state officials deride this as illegal contraband.96 Residents define themselves as negociantes (businessmen), fleteros (truckers who provide rides), or comisionistas (people who work on commission) rather than as smugglers. I use the terms businessmen and middlemen (those who act as intermediaries in border exchanges) because business tends to be dominated by, and associated with, men. Yet women also play important roles in these enterprises. Itty Abraham and Willem Van Schendel distinguish between illegality and illicitness by drawing attention to how illegality, a political determination of acceptability determined by states, and licitness, a social distinction of legitimacy, may clash; ideas about what is considered to be legitimate or illegitimate by states may not be shared by those engaging in these activities.97 They emphasize how borderlands complicate the assessment of activities that cross between different social and political spheres of regulation.98 Border inhabitants may carry legacies of exclusion by the state, experience state violence directed at asserting sovereignty at the margins, encounter different legal systems in close proximity, and continue cross-border social, kinship, ethnic, and economic ties.99 The imposition and enforcement, or lack thereof, of national borders may create or interrupt cross-border ties, whereas border enforcement facilitates some interactions as it criminalizes others that could otherwise be viewed as petty commerce.100 Differentiating between licitness and legality, however, also fails to account for the complexity of contingent views of legality and licitness.101 Social perceptions often shift situationally and in relation to one’s particular position in relation to the smuggling economy. Taking local ethical evaluations seriously challenges dominant state-determined assumptions of illegality by drawing attention to illegalization as the social and political process by which people, places, or objects become designated as illegal and therefore the target of sanction, moral outrage, and violent containment, prohibition, and enforcement.102 By illuminating illegalization as a social and political process rather than as a natural and normative state of affairs, I call attention to illegality fetishism, drawing loosely from Marx’s notion of commodity fetishism.103 Illegality surfaces as a thing in and of itself with an associated inherent negative value. It functions to validate, and leave unquestioned, a host of disciplinary measures, which become divorced from the political, economic, and social processes that produce, designate, and naturalize illegality.104 Illegality as process highlights how these perceptions and their salience shift over time and space. Illegalization, as immigration scholars have argued, is often invoked as a rationale to justify differential treatment while denying the ways the extralegal economy may subsidize the formal economy and preserve prevailing arrangements of economic, racial, and political privilege.105 At the border, viewing the route and its inhabitants as illegal at once justifies state neglect as well as surveillance and discipline. In practice, however, everyday dealings between state agents and border residents vary, ranging among neglect, opposition, suppression, collusion, and even mutual benefit.106 It is through such daily maneuvers that the relationship among security, illegality, and trade takes shape in the borderlands. 1. El Financiero. September 7, 2006. 2. I do not reference these articles because doing so would reveal the identities of the border communities. 3. Isacson, Meyer, and Morales 2014: 7, 10. Seven are located on the Chiapas–Guatemala border (Basail Rodríguez 2016b: 5). 4. Isacson, Meyer, and Morales 2014: 10 and Secretaría de Seguridad y Protección Ciudadana 2015. The number of vehicular crossings varies across sources. 5. I do not cite this report, so as to preserve the anonymity of the crossing. 6. See description of incident in Galemba 2013. 8. See Goldstein 2010, 2012; Zilberg 2011; Jusionyte 2015; Aguiar 2014; and Arroyo 2006. 9. Also see Zilberg 2011: 6, 4; and Goldstein 2012: 17. 10. See Andreas 1999: 96, 2010, and 2011. 11. See Villafuerte Solís 2009. 12. Gúzman Mérida 2004: 138, translation mine. 13. Just as security discourses are repeatedly interrupted, Goodale and Postero (2013: 1–2) point to the contested and interrupted nature of neoliberalism in Latin America to demonstrate how new possibilities emerge even alongside the continued dominance of neoliberalism. 15. Vázquez Olivera 2010 and Clot 2013. 16. Clot 2013: 16 and Andreas 1999. 17. Clot 2013: 8; Mathews and Vega 2012; Gauthier 2007; and Basail Rodríguez 2016b. 18. All names are pseudonyms unless specified to protect identities. Some individual traits are also altered, or I created composite characters to protect informants. 19. Highway expansion in the 1990s has also been linked to surveillance against the Zapatistas (Hernández Castillo 2001 and Nash 2001: 93). 20. In its most basic facets, neoliberalism refers to an assemblage of political and economic practices guided by a belief that individual and societal well-being can be best guaranteed by advancing the free market (Harvey 2005: 2). 21. Thomas, O’Neill, and Offit 2011: 9 and Burrell 2013. 25. Fox and Haight 2010: 11 and Wise 2011. 26. Morales 1999: 990 and McCune et al. 2012. 29. Hernández Castillo 2001 and Kelly 2008. 31. Villafuerte Solís 2005: 479. 32. CONEVAL 2015 and World Bank Data 2014. 34. CONEVAL 2015 and Villafuerte Solís 2015. 35. Villafuerte Solís 2005, 2009 and Secretaría de Economía 2016: 24. 36. Paláez-Herreros 2012: 207; Villafuerte Solís and García Aguilar 2006; and Villafuerte Solís 2005. Also see Fábregas Puig and Ponciano 2014. 37. Thomas, O’Neill, and Offit 2011: 8. 38. Thomas, O’Neill, and Offit 2011: 8; Fischer and Benson 2006; Little 2013; Goldín 2011; and Thomas 2011. 39. Benson, Thomas, and Fischer 2011. 43. Economist David Lozano, cited in Conn 2014; and Villafuerte Solís 2005. 44. See Centeno and Portes 2006 on the role of the informal economy. 45. U.S. Census Bureau 2017; also see Paley 2014. 48. Hristoulas 2003: 40 and Andreas 2003: 13. 49. Pickard 2005. See Gilberto Rosas (2006: 344) on thickening the border, which can also be applied to the expansion of U.S. border policing to the Mexico–Guatemala border. 50. Birson 2010 and Jaramillo 2001. 51. Hristoulas 2003: 41 and Hufbauer and Vega-Cánovas 2003: 128. 52. Benitez-Manaut 2004: 14 and Sandoval Palacios 2006. 54. Villafuerte Solís 2014: 127–128. This later became the Mexico–Guatemala High-Level Security Group. 55. Johnson 2008; also see Nevins 2014. 56. Ogren 2007: 210; Sandoval Palacios 2006; and Villafuerte Solís and Leyva Solano 2006. 57. Benítez-Manaut 2004 50 and Villafuerte Solís and Leyva Solano 2006. 58. Tenuto-Sánchez 2014 and Pickard 2003. 59. Isacson, Meyer, and Morales 2014: 5. 60. Villafuerte Solís 2004: 67, translation mine. 61. See Sandoval Palacios 2006. 62. For example, see Hufbauer and Vega-Cánovas 2003: 128. 65. Ibid. : 5–6; also see 2002, 2000. 66. Andreas 2003: 6 and Figueroa, Lee, and Schoik 2011. 69. Gomberg-Muñoz 2011: 34, 303. 71. Isacson, Meyer, and Morales 2014: 21. 76. Isacson, Meyer, and Morales 2014: 31 and Paley 2014. 77. Alianza Mexicana contra el Fracking 2015. 79. Isacson, Meyer, and Morales 2014. 80. Seelke and Finklea 2017 and Isacson, Meyer, and Morales 2014: 5. 81. CIP Americas Program in MAWG 2013: 18. 82. Paley 2014: 25–26, 35. See Conclusion for updates on impunity in Mexico. 83. U.S. Department of State 2017; MAWG 2013; and Abrego 2014. 84. MAWG 2013: 3 and Paley 2014. 88. Isacson, Meyer, and Morales 2014, citing a 2010 State Department cable. 89. Hart 1973; see Goldstein 2016: 19–20; Castells and Portes 1989; and Centeno and Portes 2006: 25–26. 90. Centeno and Portes 2006: 26. They draw from Castells and Portes 1989. 91. Ibid., drawing from Castells and Portes 1989. 92. See Goldstein (2016: 21, 23), drawing from Gandolfo (2009) on fluidity between formality and informality. 93. Donnan and Wilson 1999: 105. 94. Aguiar 2014; Heyman and Smart 1999; Smart 1999; Galemba 2013; Davis 2012; and Goldstein 2016. 95. Andreas 2011: 7; Friman 2009a; and Heyman and Smart 1999. 96. Also see Basail Rodríguez 2016b: 13. 97. Abraham and Van Schendel 2005: 4, 25; Martínez 1994; Clot 2013; Grimson 2002; and Jusionyte 2015. 98. Abraham and Van Schendel 2005. 99. See Donnan and Wilson 1999 and Martínez 1994. 100. Donnan and Wilson 1999; Abraham and Van Schendel 2005; Wilson and Donnan 1998; and Galemba 2013: 276. 101. See Karibo 2011: 85. 102. See Thomas and Galemba 2013; Heyman 2013; and Jusionyte 2015. 104. See Comaroff and Comaroff (2006) on the fetishization of the law in the postcolony where calls for the “rule of law” or more law are often used to justify corruption, violence, and illegality. Also see Penglase 2011. 105. For example, Bacon 2008 and Gomberg-Muñoz 2011.